The ability to create high-quality videos for your marketing campaigns has gotten much easier in the past few years. Most cameras and even smartphones will turn out amazing productions, all while never needing to hire a designer or open up an expensive and confusion production software. It just makes sense to utilize videos in your email marketing and send customers on your list to an engaging online video with a great call to action. While a quality visual production can help you inform, educate and engage with your customer base like no other form of media — we also have some great email and video marketing tips to help you get started. Implement these video marketing methods into your existing email outreach efforts today and see better engagement and ROI across the board. Gaining the attention of your audience is crucial if you want to survive in your marketplace. Potential customers don’t want to get stuck reading another product description or sales email that’s loaded with text. To really grab their attention, you must deliver some other type of information that helps increase engagement. Of course, that solution is video. Your prospects are much more likely to make a sale when they are shown how a product works or can see how your services will benefit them. A video that describes your product will receive four times more engagement than a description that’s written in text. These statistics show that including video links in your email marketing campaigns will boost the click-through rates that you receive. Have you noticed that people are extremely busy in this new era of the internet? There’s plenty of distractions to keep them occupied and attention spans are at shorter time periods than ever before. To combat this and grab the attention of your prospects, it’s important that you introduce media that is stimulating and highly engaging — you can do that with videos in your emails. The human brain has the ability to process visuals at a rate that’s 60,000 times the speed of reading words. You can take advantage of this by providing an explainer, how-to or industry news video to your community — that’s much more appealing than a long wall of words. 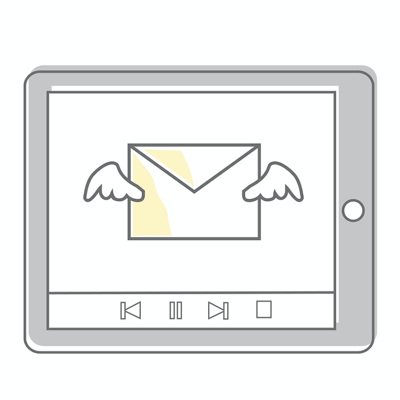 You really can’t convey the same type of emotion in email copy as you can when you use video. By combining sound and visuals, it’s much easier to tap into the senses of your prospects. Human behavior is driven by a need to receive pleasure and avoid pain. Your marketing message should teach them how to get to the point that they are at now to where they want to be in the future. Good ad copy in your emails can start this process, but you can really bring it home by adding visuals to the concept. If you are like most people who are online, you get a great number of emails from merchants, friends, and work. Looking at every email eats up valuable time, so you probably pick and choose which emails you want to open. With this in mind, as a marketer, you understand that half the battle is getting your email recipients to open the emails that you send. By including the word “video” somewhere in the subject line, it can increase your click-through rate by as much as 300 percent. These statistics indicate that video can play a huge role in your email marketing campaigns. Your customers want to be entertained, educated and informed. The use of video is definitely seen as having a higher value than text. Your audience will notice that you have put more effort into your content when links take them to videos. Customers will be willing to commit more time to your business and even pay more when they perceive a higher value. A customer is much more likely to check out the products or services that you sell if they have a video to watch when you send them from your marketing email to a landing page. When you use video to show the personality of your company, it strengthens your brand and enables you to engage with your customers at a deeper level. This earns their trust and makes you more credible. In fact, statistics indicate that 90 percent of customers who watch videos say that it helps them decide if they are going to buy your products. By adding links to videos in your email marketing campaigns, you have more opportunities to inform and educate your customers and build the trust that transforms into more sales. People learn in different ways. Many of them are visual learners who retain more when they have visuals to guide them. In addition, some individuals learn more when they have access to auditory components. Video taps into both of these styles of learning. You can provide much more clarity to your customer base when they can actually observe a demonstration of your products. Video also helps create higher ROI. When polled, about 75 percent of business owners indicated that the use of video marketing resulted in a higher ROI. While video may not be the easiest form of media to create. The final pay off is much better than other forms of content such as text or infographics. There are many free tools or inexpensive options that you can use to edit videos, which makes producing quality video more affordable. Not to mention, many can just be created by using a smartphone. It’s not the quality or design that matters as much as the explanation of the service or product. It’s clear that video is a strong marketing tool that you should be using in your business. By combining it with your sales emails, it will help boost interaction and your bottom line. At the same time, if you aren’t focusing your efforts on growing your mailing list size and reaching new audiences, then your email marketing and video efforts might go in vain. To continually find success in online marketing, you need to reach new audiences that are truly interested in what you have to say and offer. This is where After Offers comes in. Contact one of our team members and discover how we can double the size of your mailing list, while also making sure all subscribers are 100% opt-in and of the highest quality possible.